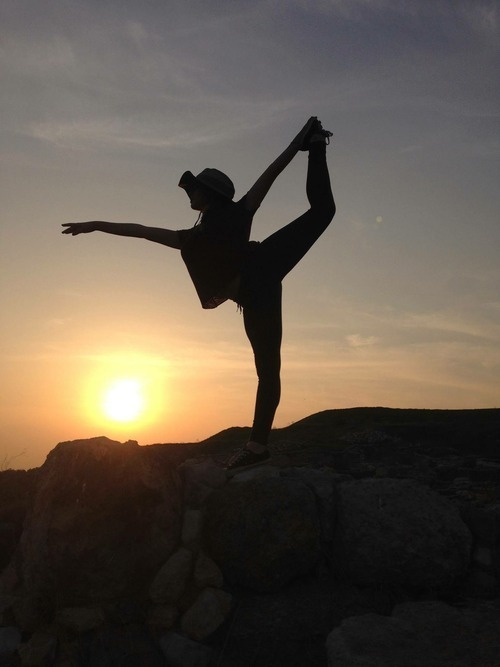 Q: I saw an amazing photo of you recently from an AMHSI tiyyul where you were posing on a cliff against the sunset. How long have you been dancing? A: I have been dancing, since I was 3 years old. Q: What kind of dancing do you do? What’s your favorite? A: I was trained in Russian ballet until I was twelve years old when I decided to stop dancing for spring board and platform diving. I continued to take classes but I reduced the amount of time I was dancing. I also dance or have danced contemporary, modern, jazz, lyrical, flamenco, African, tap, Bollywood. Dunum, hip hop (but I don’t really like it), aerial and trapeze. Q: Do you think you’ll always dance? A: I Hope to always dance. I’d like to keep up with it. I dance more for the fun of things; maybe I’ll do it as a minor in college. I’d love to perform. Q: You seem to do a lot of physical activity! Are you still diving? Do you want to do it in college? A: I recently stopped to go back to dancing but I started doing it the summer before 8th grade. I gave it up because of dancing and because the practices ran really late until 9:00. I was still considering going back but because of AMHSI, I decided to stop diving bit I miht pick it up again next year. Q: You’re involved in a program called “Best Buddies." Can you tell me about that? A: Best Buddies is an international organization in which we form friendships with people with intellectual and developmental disabilities. The main purpose is to break that barrier that a lot of people have when encountering people with these disabilities. If you’re in the program, you get paired with a buddy. My buddy’s name is Frankie; we hang out a lot together – true friendships can be hard for people with disabilities to form. Frankie – he’s my age – he’s a junior in high school. We play basketball together, he’s really funny. We text a lot. It’s harder now that I’m in Israel so I haven’t talked to him that much. We also like to talk about sports. He’s a really cool guy. The organization also, on a wider scale, wants to provide jobs for adults with disabilities. Q: How long have you been involved in the organization? How did you get involved? A: I first got involved when I was in 9th grade, so for about 3 years and it’s something that I really fell in love with. I stumbled upon it at school and got more involved by becoming a member of the Executive Council and I also went to Indiana University for a conference. I wanted to get involved nationally; I’m now on the California Leadership Council, which is comprised of 6 different committees. I am the Outreach and Advocacy Committee Chair in California. I help to spread the word about Best Buddies, create events to talk about the disabilities rights movement, get people involved and pair with other nonprofits. A: I heard that you raised a seeing-eye dog. How did that happen? We’re raising our 3rd one right now. We raised our first one when I was in 7th grade for my Bat Mitzvah project. His name is Blake; he lives with a veteran in California. Only about 30% of the dogs pass into the program – they are raised in homes for one and half years and then Guide Dogs of America trains them. If they get through the program, they become a seeing-eye dog. Our second dog is named Enzo. We raised him for a year and half but he failed out after half a year in the course and we took him back in November 2014. When dogs fail the course, they can become other service dogs like bomb sniffing dogs. Our third dog is named Bowser. We got him during the end of September. Q: Is it hard to let the dogs go? A: It wasn’t really for me because I knew when taking them in that it wasn’t my dog and I’m pretty good at that. It’s fun when we have them. It’s really cool to see where they get to go next. We’re still in touch with Blake’s owner. It’s really cool to see what he’s been able to do. That’s part of raising the dogs – if they pass the course; we get to meet the person who receives dog at their graduation. Knowing that you’re not just giving it up for no reason makes it easier. A: One of my mom’s friends is an ambassador for the program. I was reluctant to go and something just clicked and I wanted to go. Last year I decided to come and I signed up. 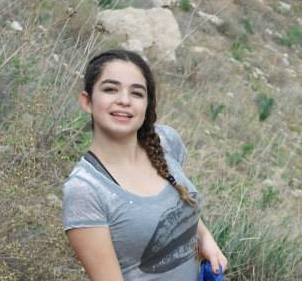 Q: What’s your favorite memory from Israel so far? A: Hanging out in the dorms has been really fun; there are always people coming in and out. You can sit outside and meet a bunch of people. We’re only 12 people so we’re already best friends. Being able to hang out with them is my favorite part. Q: Would you recommend this program to your friends? A: I would definitely recommend the program to my friends back home. Israel has this essence that’s hard to describe. I’m not very religious but now I’m becoming more open minded, it’s really nice to be here and to see the effects that Israel has on other people. Visiting the Kotel (Western Wall) and watching how much it affected other people made a humongous impact on me and how amazing this country is and that it’s still standing. Also, published by the LA Jewish Journal here.